Xuefei Yang talks about her latest release on EMI. You have a new disc of Bach (violin) concertos out on EMI with the Elias Quartet. Congratulations – it’s a beautiful album! Thank you! Of all my CDs this has definitely been the most challenging. These masterpieces are so famous on the original instruments and have already been recorded so many times by great artists. I knew I had to make them sound convincing on the guitar. Guitar concerto repertoire is quite limited, especially for baroque music because the instrument did not exist then! We have Vivaldi’s lute and mandolin concertos which are very nice, but they’re short and quite light. I wanted to play some substantial concertos from the baroque period and I really believe the guitar is suited to Bach’s music. I love his violin sonatas & partitas, which we play on guitar, and I started to wonder about the concertos. You transcribed all the violin concertos yourself: were you inspired by Bach’s own transcriptions? I found out Bach transcribed these concertos for harpsichord which gave me an idea of how they could work on a polyphonic instrument like the guitar. I looked at how he did the transcriptions and that really convinced me I could do it! It must have been a big task? Last year, apart from performing, the whole of my focus was this. I spent a long time doing these transcriptions. I kept making changes, especially once I started performing with the Elias Quartet and I heard how it was sounding. Even in the studio we were adjusting details right at the last minute. It’s quite fun to do transcriptions but it’s a job that never ends! They are wonderful; it was a very happy experience and this was quite a unique experience for them too. It’s important to work with good musicians because you influence each other. It’s a very different experience from talking to a conductor and orchestra; we were more like an ensemble, a quintet. Everybody exchanged ideas; it was a really nice experience. 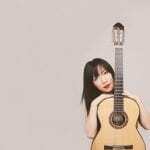 You were the first classical guitarist in China ever to enter a music conservatoire and, later, to launch an international career. Do you feel like a pioneer? I feel very honoured to be called that. As a teenager I didn’t even think about it – I just wanted to play music and I wanted to play the guitar and I knew the only way to do so was to enter a conservatoire. But to simplify a very long story, I had to fight and overcome a lot of difficulties to do this. I am having a career I never would have dreamed possible. Can you describe some of those difficulties? The environment for learning classical music in China was not that great. During the Cultural Revolution just before I was born, it was forbidden to play western instruments. The guitar was regarded as a hooligan instrument, something that ‘bad people’ play. So how did you start learning it? At my primary school when I was seven, I was put into a guitar group. Ours was maybe the only school in the whole of China that had such a group. My parents wanted me to learn an instrument to calm me down, as I was energetic as a child. They were thinking of the accordion which was popular at that time as it was used to accompany choirs. The music teacher said the accordion was too heavy for a little girl, but I could join the guitar group that she had started. It was like destiny, like fate – a beautiful fate. I had no idea about the life of a classical musician but as a teenager I just knew this was what I wanted to do. But your parents weren’t happy? They didn’t think it was a proper job, or secure. They wanted me to follow a more traditional path of going to university and getting a good job. Yes, but they still sometimes worry. They love music, but they are concerned that I travel so much and I still don’t have a secure job with a salary every month! Do you think of yourself as a role model for the next generation? I hope very much to be a role model for young people (and their parents); to encourage them to play this beautiful instrument. When I grew up, there was no role model in China. I go back to perform and give master-classes every year and the popularity is growing: now maybe there are ten conservatoire guitar faculties in China with 10-15 students in each. Compared to other departments, it is rather small, but it is growing! Do you have any musical heroes or inspirations? I have many! Rodrigo, Yo Yo Ma… and of course John Williams, When I was seventeen, he came to perform in Beijing and gave a master-class. I was lucky enough to play for him and he was very encouraging. I asked him what should I do, and he advised me to go to London. I was very fortunate that the Royal Academy of Music gave me a full scholarship that enabled me to study, because my family would never have been able to afford it. The Academy was wonderful, and also London as a cultural centre, it was so vibrant, there is so much going on. Now it is my home. What advice would you give to a Chinese young guitarist looking up to you? Don’t restrict yourself to the guitar world, but immerse yourself in the whole of music. Music is a big sea, a big ocean. Love what you do and keep doing it. And remember that nowadays the globe is a village, so even if you don’t have the chance to study in Berlin or London, if you have the mentality to keep studying you can learn everywhere. Do you have much time for life outside of music? I love life! Music is definitely not the only thing in my life. I like to go to movies, read books, chat with my friends, I think I have a quite balanced lifestyle. The more colourful a life I experience the more I enjoy my music. As I get older, I really feel that every improvement and change in my music comes from my life experience, my maturity as human being. In fact, the older I get, the more I feel that life has only just started?